Sodexo’s annual Foundation charity dinner has raised £174,000 for Stop Hunger, a campaign that aims to tackle poor nutrition in local communities across the UK and Ireland. 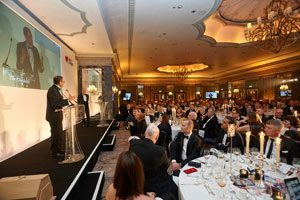 Around 500 guests were at The Dorchester Hotel, London, on 19 March, to attend the black-tie dinner, and grand finale to the year’s fundraising activities. Over the last 12 months the Foundation has given out grants of over £350,000 to 15 charity partners including FareShare, the Trussell Trust (the Foundation’s national foodbank partner), SSAFA, Focus Ireland, Magic Breakfast and Coram. The evening also marked a milestone for Sodexo and Fareshare’s 10-year partnership with the total value donated by the Foundation to Fareshare reaching £1 million. Throughout the evening, guests were offered an insight into how the money raised promotes healthy lifestyles and provides food to those in need. Four employees were recognised at the dinner for their efforts in supporting the Foundation. Best Charity Champion Award – Mark Howie, Intervention Manager, Justice Services – for his commitment to organising fundraising initiatives and encouraging work colleagues to get involved. Stop Hunger Day Award – Tim Fagan, Contract Director, Government Services – two weeks into a new role, he arranged a charity auction for the benefit of SSAFA and Stop Hunger; hosted by Matt Dawson, with 180 guests in attendance which raised over £51,000. Most Innovative Fundraising Idea Award – Marie Arthur, Account Director, Sports Leisure & Travel – the driving force behind the 2018 Stop Hunger Santa Dash – a 5K run with over 100 participants from across the country dressed up in festive clothing who ran to raise money for Stop Hunger. Volunteering Award – Omy Lawal, Department Administrator in Sodexo’s legal team – for her commitment to supporting the Foundation’s charity partners. The post Sodexo’s Foundation charity dinner raises £174k appeared first on FMJ.